Who do you see when you look at the image above? 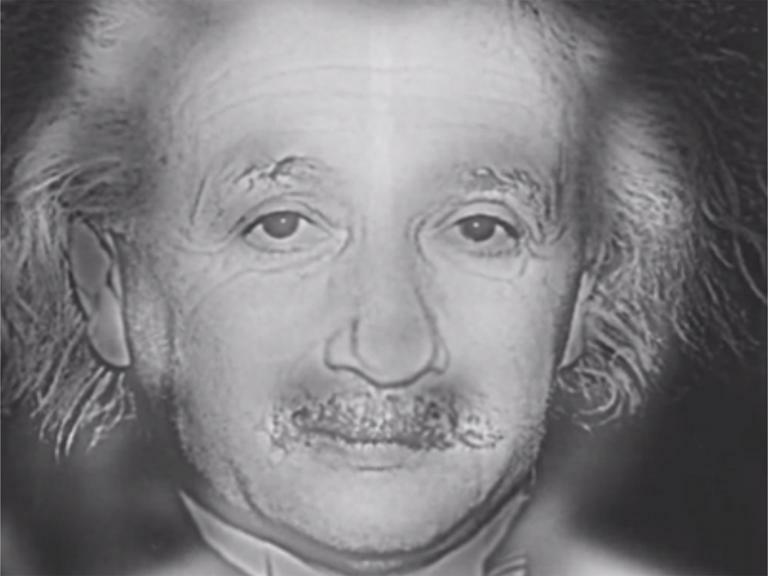 If you see Albert Einstein, your eyesight is probably pretty good. If you see Marilyn Monroe, you might want to get your eyes checked. The picture is called a hybrid image: which means it is a “low spatial frequency” image combined with a “high spatial frequency” image. A high spatial frequency image will look like an image with the contrast turned up really high – only the clear lines of the image are visible. A low spatial frequency image will look like a blurry, out of focus image – everything except for the finer details and clear lines will be visible. When you combine these two, you get what looks like a mostly normal image, but with a twist. If you can see a picture of Albert Einstein, try walking away from the screen or un-focusing your eyes. If you’re finding it difficult to see Marilyn, keep walking away from your screen, and she should eventually appear. The better your eyesight is, the more likely you will be to pick up the finer details in the image – high means you’ll be more likely to see the high frequency image. In this case, this is the Einstein image. If your eyes have difficulty picking out details, you will see Marilyn Monroe first, since you can’t properly see the clear details of Einstein.